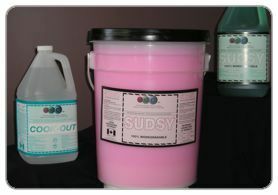 SUDSY: A lemon scented anti-bacterial liquid green dish detergent for all hand washing of glassware, flatware, pots pans etc. SUDSY PINK: A pink bubbel gum scenter,economical dish washing detergent. COOK-OUT: Griddle-fryer and oven cleaner. A 12.5% Sodium Hydroxide emulsion. CHLOROCLEAN: A chlorinated commercial liquid dish washing detergent for use in stainless steel dishwashers. REFLECTION: A rinse aid for commercial dish washing machines. Used in conjunction with "Chloroclean" for the effective rinsing of flatware and glassware. CHLORINATED SANITIZER: 6% chlorine solution for sanitizing in commercial dish washing machines. SPARKLE: An ammonia based, glass cleaner. SPARKLE CONCENTRATE: Concentrated sparkle 30:1 sparkle glass. VINEGAR: A neutralizing rinse for commercial use only. This is a non-consumable product. 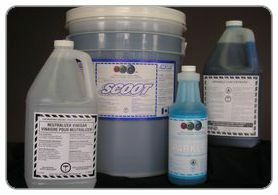 SCOOT: Safe on most hard shiny surfaces plus vinyl - non-ammoniated.